One thing Frontiers Music and President Serafino Perugino is really good at doing is arranging terrific musical collaborations. This time around it's Nordic Union featuring Pretty Maids vocalist Ronnie Atkins and, from Eclipse and W.E.T., guitarist, songwriter, and producer Erik Martensson It's another winning combination. And for several reasons. Martensson is an exceptional songwriter who emphasizes melody and harmony, strong guitar lines, an abundance of groove, and some simply catchy hooks in arrangements and lyrics. Atkins has always been a strong hard rock and heavy metal singer. He's in his element here. His assertive, raspy, yet melodic style fits the music. No doubt Martensson had this in mind as well when crafting the songs. 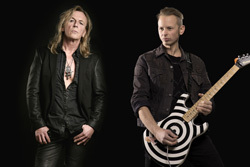 As to the songs, the Nordic Union sound, it's classic AOR infused melodic hard rock with a significant metal edge. This largely comes from the sharp heavy riffage, but also the significant rhythm. So then pretty much everything here rock hard. Some of the best cuts are When Death Is Calling, The War Has Begun, Go, and Wide Awake. All these loaded with fiery guitar solos. There are some tamer moments with the ballads Every Heartbeat and True Love Awaits, which will probably remind most listeners of Martensson's AOR style with W.E.T.. Actually, after a spin or two, I thought Nordic Union sounded like a hybrid of Pretty Maids and Treat. Nevertheless, Nordic Union's debut album delivers the goods: superbly crafted and entertaining melodic hard rock with a large metal edge. Recommended. 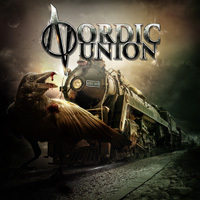 Nordic Union's debut album delivers the goods: superbly crafted and entertaining melodic hard rock with a large metal edge. Recommended.